Quad Stayer: FMC EQ s/n 977. Gluer: FMC 405 24” Roll s/n 2310, Conveyor: FMC 18”.Wrapper: HNS FMC/Beuerle &amp; Crockett , s/n 3061 w/ HF Stokes feed. Extension edge rollers. Quad Stayer: FMC/Kingsbury &amp; Davis 3LSU s/n 695. Gluer: FMC 405-c 24” Roll simulated loose wrap s/n 3041-r selective., Conveyor: FMC 18”.Wrapper: HNS FMC/Beuerle & Crockett, s/n 1373 w/ HF Stokes feed. Quad Stayer: FMC mdl EQ-2 s/n 2581 Gluer: FMC 405 25 ½”” Roll s/n 2143. Conveyor: FMC 26”.Wrapper: BNS FMC/Beuerle & Crockett, s/n 1851 w/ BF Stokes Feed. Quad Stayer: FMC EQ-2 s/n 2580 5” tape. Gluer: FMC 405 s/n 4095. Conveyor: FMC 26”.Wrapper: FMC B s/n 1731 w/BF Stokes Feed, Small box plunger. Quad Stayer: FMC EQ-2 s/n 2154. Gluer: FMC 405 s/n 2871. FMC B w/ Stokes Feed. Quad Stayer: FMC EQ-2 s/n 1086. Gluer: FMC 405 s/n 1745. Wrapper: FMC B s/n 1540 w/ Stokes feed. Quad: FMC EQ-2 s/n 2132. Gluer: FMC 405 s/n 2937. Wrapper: FMC h s/n 3184 w/ HF Stokes Feed 1052. Quad Stayer: FMC EQ-2 s/n 2131. Gluer: FMC 405 s/n 2936. Wrapper: FMC h s/n 3183 w Stokes Feed 1051. Flange Bender: FMC CB s/n 323. Conveyor: FMC mdl D s/n 1394. Wrapper: FMC d-p s/n 1394. Flange Bender: FMC CB s/n 272. Gluer: FMC 406 s/n 2646. Wrapper: FMC D s/n 1340 d.
Flange Bender: FMC CB s/n 307. Gluer: FMC 406 s/n 2674. Wrapper: FMC D s/n 1367df. Flange Bender: FMC CB s/n 330. Mobil Quad: FMC 3BAAF s/n 612. Quad Conveyor: Stokes &amp; Smith 4” s/n 433. Gluer: FMC 405-C s/n 2712-r.
Wrapper: FMC D s/n 1403. Gluer: Stokes &amp; Smith 404 s/n HK1648 Selective. Conveyor: Stokes &amp; Smith 21”. Wrapper: High Production/Crockett Alpha s/n 296. Gluer: FMC 405 s/n 2664 Selective. Wrapper: High Production B s/n 137. Samuel Parry Type-F 16” Mitering Machine s/n 582A. Samuel Perry / Stokes &amp; Smith Style-F 16” Mitering Machine s/n 115. Samuel Perry / Stokes &amp; Smith Style-B 14” Mitering Machine s/n 1386K Samuel Perry / Stokes &amp; Smith Style-B 14” Mitering Machine s/n 1363A. Samuel Perry / Stokes &amp; Smith Style-B 14” Mitering Machine s/n 874. Samuel Parry Style-B 14” Mitering Machine s/n 6304. Samuel Parry Style-B 14” Mitering Machine s/n 1455. Samuel Parry Type-B 14” Mitering Machine s/n 1435. Samuel Parry Style-B 14” Mitering Machine s/n 885. Kluge mdl. EHD 14” x 22” Hot Stamping Machine s/n GD141860 w/ Vacuum Loading. F.P. Rosebach 24” Thermal Bender w/ Fence ystem. Stokes & Smith Box Wrapper s/n 459. Stokes & Smith Box Wrapper s/n 375. Stokes & Smith mdl. 405 25” Roll Gluer s/n HK5059, Stokes &amp; Smith 24” Conveyor, 30” Roll Press. M.D. Knowlton 17” Gluer and Shear. M.D. Knowlton 14” Gluer and Shear. M.D. Knowlton 8” Gluer and Shear. Kensol Type Z32 32” Roll Gluer s/n 7042. Potdevin mdl. MO-59 4” Roll Gluer s/n 155. Kenneth Moore 24” Roll Press s/n B130. John Robinson 6” x 6” Power Corner Notcher s/n 6645 w/ Fence System. (2) M.D. Knowlton 6” x 6” Power Corner Notchers w/ Fence Systems. Globe Mfg mdl. NGAT Thumb Hole Notcher s/n 10692. Stokes &amp; Smith Thumb Hole Notcher s/n 769. Rouselle No. 1A 8-Ton OBI Stamping Press s/n 1359. Kenco No. 8 mdl. 8-202 8-Ton OBI Stamping Press s/n GS573-960. Lamination Line Gluer: Stokes &amp; Smith 405 s/n HK5059. Conveyor: Stokes & Smith 24”. Polar Mohr mdl. 145EL 57” Paper Shear s/n 2057 w/ Polar Mohr Controls, 61” Cut Length Cap, Light Curtain, 19” x 129” Table. Orper VEB Polygraph mdl. SEPTA 115 TV 45” CNC Paper Shear s/n 56356 w/ CNC Controlled Back Gage. Wohlenberg MCS-TV Type 92 36” Paper Shear s/n 3124-020 w/ Controlled Back Gage, 16 ½” x 83 ½” Ball Top Table, Light Curtain. John Jacques & Son 45” Guillotine Shear w/ Back Gage. C & S Crathern & Smith mdl. 4020 Transparent Box Machine s/n 225. FMC mdl. SVF Transparent Box Machine s/n 308. FMC mdl. SVF Transparent Box Machine s/n 205. Heidelberg 21” x 28” Cylindrical Die Cutter s/n 147-7738. Thompson 24” x 34” Die Cutting Press. Heidelberg “Windmill” 12” x 18” Die Cutter s/n 56482E w/ 12 ¾” x 17 ¾” Table, Vacuum Feeder. Kensol mdl. 165 Roll Leaf Hot Stamping Press. Charles Beck 45” Paper Sheeter s/n 1393 w/ Speed Controller, Stacker Out-Feed, Roll Feeder, Gantry Style Loader w/ Yale Electric Hoist. Charles Beck 36” Paper Sheeter s/n 766 w/ Speed Controller. John Robinson 45” x 52” Double Score Machine s/n 596 w/ Air Clutch. John Robinson 45” x 52” Double Score Machine s/n 2163. John Robinson 45” x 52” Double Score Machine s/n 6312. M.D. Knowlton 45” Single Score Machine. M.D. Knowlton / Globe Mfg 36” Slitter s/n RKS12701. Ingersoll Rand SSR-EP15 15Hp Rotary Air Compressor s/n LX2652U00131 w/ 53 CFM @ 125 PSIG, 120nGallon Tank, 32,977 Hours. Potdevin 40-Ton Hydraulic H-Frame Press s/n CF27317. Kalamazoo 12” Pedestal Disc Sander. (2) Craftsman Bench Model Drill Presses. 2008 Freightliner “Business Class M2” 24’ Box Truck Lisc# 8L97861 w/ Cummins Diesel Engine, Automatic Trans, Lift Gate, 145,091 Miles, VIN# 1FVACWDT38DZ78052. 1997 Ford Econoline 350 Cargo Van Lisc# 5S30951 w/ Triton V10 Gas Engine, Automatic Trans, AC,147,017 Miles, VIN# 1FTJS34S1VHC07646. Hyster S40XL 4400 Lb Cap LPG Forklift s/n A187V08335H w/ 3-Stage Mast, 187” Lift Height, Side Shift, Cushion Tires. Yale NR035ANDS24TE095 3500 Lb Cap Stand-In Electric Pallet Mover s/n B815N03269W w/ 212”Lift Height, Charger. Lantech Q-Series Semi-Automatic Stretch Wrapping Machine (Pallet Wrapper). Sato Type 1065-2H- 28 Package Tying Machine s/n 10943774. Doug Morris mdl. 70 Package Tying Machine s/n 76183. B.H. Bunn Package Tying Machine. Nichols mdl. EA30606HDS6C 30” x 60” Hydraulic Bailing Press s/n 4476. (31) Sections of Pallet Racking. Kingsbury &amp; Davis mdl. 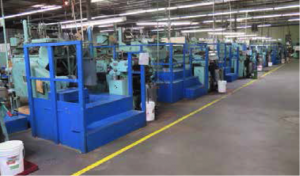 3HS-AAAB Thermo-Plastic Quad Stayer s/n 644 w/ 12” Drop-Off Conveyor, Kingsbury &amp; Davis mdl. 2 Stacker s/n P-196. FMC mdl. RS Quad Stayer s/n 1657 w/ FMC mdl. SSUE 12” Staker s/n P335. FMC Packaging / Kingsbury &amp; Davis mdl. EQ Quad Stayer s/n 1043. Kingsbury &amp; Davis mdl. LS-1 Low Speed Quad Stayer s/n 485. Kingsbury &amp; Davis mdl. LS-1 Low Speed Quad Stayer s/n 458. Knowlton No. 9 Hand Stayer s/n 9173. Knowlton No. 9 Hand Stayer s/n 9080. Knowlton No. 7 Hand Stayer. CASH OR CASHIERS CHECK ONLY. 15% BUYERS PREMIUM ON ALL PURCHASES. 2016 Flow 5 Axis, Model M4C 4080 XD 049104-3 Waterjet, 2016 Mach 4 4080C Waterjet, 2016 Haas VF-4SS CNC VMC, 2015 Haas VF-6/50 CNC VMC, 2000 Haas VF-11 CNC VMC, 2008 Haas TL-4 CNC Lathe (Large Bore), 2014 Okuma Genos L200E-M CNC Lathe w/ Live Tools, Trak FHM5 CNC Mill, 2016 Marvel 2150A-PC3S Vertical Tilt CNC Band Saw, Blanchard 84” Rotary Grinder, Large Selection of Machine Tools, Miller & Lincoln Welders, Cat 150 KW Generator, Power Pro 45 Generator, Tooling, Lista Cabinets, 2) Siemens Sinamics Perfect Harmony GH180 Type 6SR3 750A Medium Voltage Variable Frequency Drive Units, Etc. Grinding & Lapping Equipment Power Shears, Press Brakes, CNC Turret Punch, Heald 273A ID Grinders, Blanchard Rotary Grinders, Mills, Lathes, Speedfam Lapping Machines, Fabrication Tools and Forklifts. Amada Power Shear, Amada 220 Ton CNC Press Brake, Cincinnati Press Brakes, Wysong Plate Rolls, Amada Notchers, Cincinnati 12ft Power Shear, Trucks, Forklifts, Material, Power and Hand Tools, Stainless Steel Restaurant Equipment, Etc.